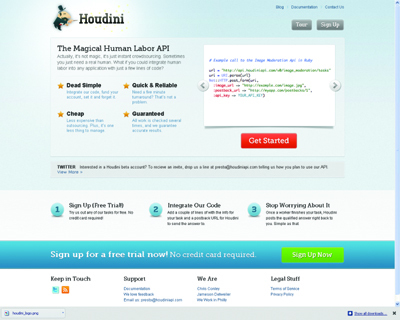 Houdini’s API makes it easy to integrate human labor from Amazon’s Mechanical Turk directly into web applications using only a few lines of easy to read code. Working with Mechanical Turk’s API directly is cumbersome. Houdini handles the complicated part of interfacing with Mechanical Turk in the background, allowing you to quickly integrate your application using simple, intuitive language.